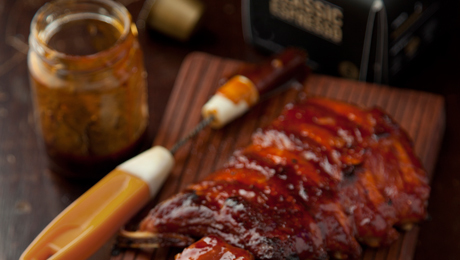 Finger-licking succulent ribs with a fantastic BBQ sauce. Preheat the oven to 160°C/325°F/ gas mark 3. Line a roasting tin with aluminium foil. Cut each rack of ribs in half. Using a sharp knife, notch the ribs where the bone meets the meat to make the cooked ribs easier to eat. Set the ribs on a roasting rack in the lined tin. Bake the ribs in the preheated oven for 2 hours. Baste with the barbecue sauce, below, every 10 to 15 minutes during the last hour. To make the sauce, heat the olive oil in a large pan over a medium heat. Add the garlic and cook until it just starts to change colour. Add the cider vinegar, soy sauce, ketchup and honey and combine well, then stir in the espresso. Add a pinch of salt and freshly ground black pepper to taste. Bring to a simmer and cook for 10 minutes. Use the sauce to baste the ribs in the final hour.